So you’ve decided that you want to see the world – I applaud you! – and you’re thinking of all of the amazing places you can go. You’re going to learn so much about yourself and meet so many fabulous new friends, beautiful strangers, see so many vibrant landscapes and skyscrapers, too. The world is your oyster, but the question is, where do you start? When I see lists like these I often just see suggestions for places women should travel to solo based on only one thing: safety. While crime stats are worth noting, they’re not the defining factor for a great place for women to travel alone. The best destinations aren’t just the popular and well-trodden ones, either. Some of the best places to travel to by yourself might be in the places you least expected, or didn’t even know existed yet. The best places will be where locals are particularly friendly and welcoming, or it’s social due to a shared interest like surfing or diving, and even though it might be off the beaten path a bit, it’s not so remote that you’ll be the only one there. It still has that special charm that makes it feel authentic and inviting. Sounds amazing, right? So where can you find these places? 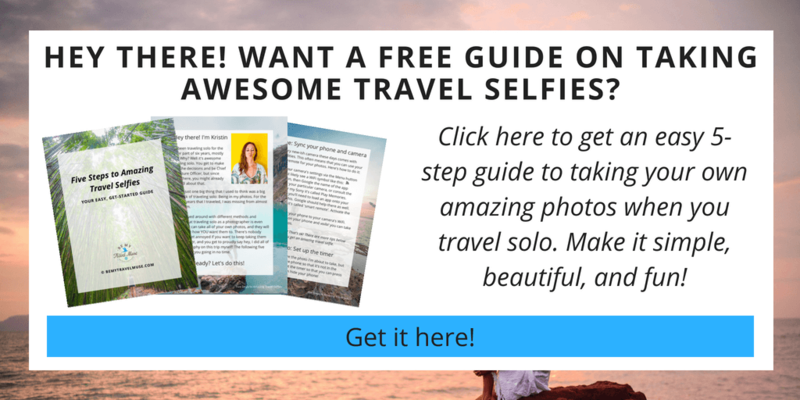 I’ve searched high and low, and these are some of my favorite destinations for solo female travel – they might surprise you! Because it’s for more than just honeymooners. It’s crazy to think that Hawaii would be a good place to travel to solo, but I was delighted to find that there were tons of things for me to do even though I wasn’t on my honeymoon. I made friends easily while snorkeling, found a lot of active adventures, like hiking to waterfalls on the Road to Hana, and found a surf school especially for women as well! Because Africa isn’t ‘scary’ after all. Africa gets a bad rap as being a scary place to travel through, and while it’s important to take precautions (here’s a list of them), that doesn’t mean solo female travelers should write it off. I love how laid-back Coffee Bay (and that whole coastline) is and how many cool other backpackers are always passing through. It’s easy to meet other people and go on long walks along the bluffs on the ocean and take in the gorgeous nature. While South Africa does have a pretty high crime rate, the bulk of it is in the cities. I loved the little towns like Coffee Bay where there weren’t many people or worries around at all. I love Tofo, Mozambique because of the type of adventurous and interesting people it attracts. It seems like most travelers in Mozambique have a cool story, and have arrived by word-of-mouth. There are only a couple of backpackers accommodations there (I stayed at Fatima’s), and scuba dive shops, both of which are excellent places to meet other solo travelers. Because Thailand’s north is even better than the south! The north of Thailand is cheaper, more laid back, and generally nicer to hang out in than the party islands to the south. I know that sounds impossible, but head up to Pai and you’ll see exactly what I mean. It’s eclectic, full of yogis and social people, and the waterfalls around there are magical. I love Pai for the laid back and free-spirited people it attracts. Because the expat scene is diverse and so much fun. Usually you have to actually be an expat to be part of the expat scene but in Chengdu, China, it’s such a nice mix of travelers, locals, and English teachers from Italy, France, Ireland, Mexico, and a bunch of other places all over the world. There are only a few bars like Jellyfish and Jah Bar that the social crowd frequents so it’s easy to see familiar faces if you stay for a little while. Because places that attract surfers are social by nature. This little surfing town on Sri Lanka’s East Coast, which doesn’t get nearly as much tourism as the booming south, is so tranquil and chill, it’s hard to leave. Places that have a sport as their main draw always attract more solo travelers, and this little surfing town in paradise is one of them. Extra points if you take the train there, one of the best parts about traveling through Sri Lanka. It’s about more than orangutans. …but you’ll see Orangutans there too, which is cool, because this is one of the only places where they live in the wild. Bukit Lawang is a tiny little trekking town with a river running through it, deep in the jungles of Sumatra. I couldn’t believe it, but after my second day there, locals and expats were calling out my name to say ‘hello’ as I walked by. It’s such a social and friendly place, they already knew me by name. It felt like a family in a way. That kind of place is paradise for a solo female traveler because they feel so welcoming and like a home. The safest country in the world. Iceland is ranked the #1 safest country in the world by Vision of Humanity, and I can attest, people left their cars running while they went grocery shopping! That’s how sure they are that nobody will steal their car. Iceland’s landscape is so unique and stunning, plus it’s great for a road trip. Reykjavik has social hostels as well, where you can find adventure partners. This guide has everything you need to know about Iceland. I geared up for the Annapurna Circuit, a 2-week hiking loop in Nepal, solo. I remained solo up until departure, and didn’t have a hiking buddy until I met one on my bus ride in, picked up two more in the coming days near the top, and expanded the group even further. By the time we finished, we were a group of six. A communal endeavor like hiking tends to bring people together. Picture jagged mountaintops covered in jungle, rising up like little waves all over the countryside, with rice paddies thrown in between every now and then. Phong Nha Ke Bang and surroundings in Vietnam is full of such friendly locals who smile and wave, and since there aren’t many places to stay in town, most backpackers are all at the same hostel – Easy Tiger – where I met and devised a plan to motorbike around the park with 6 other guys the next day. It was a blast! Even if you start out alone in the 5-day W or the 8-day O circuit trek in Torres del Paine National Park, you’ll come out of it with a bunch of new friends. For the same reasons that I loved the Annapurna Circuit, I love the social atmosphere amongst campers and hikers on this trek, particularly on the back, ‘O’, part of the trail where fewer hikers go and the crowds are more intimate. Refugio Dickson, in particular, was tons of fun thanks to the social rangers who played music and organized soccer games. Serendipity Beach in Cambodia’s Sihanoukville used to be the most coveted place for backpackers on the Cambodian coast, but I much prefer laid-back Otres Beach. It’s still the kind of bare-foot, relaxed, quiet but still fun beach place I just can’t get enough of. If you love them too check out my chillest places in the world. Because this is one friendly road trip. It’s the small towns on Ireland’s least populated coast that can be the most social. In a country that’s already pretty friendly, I found that people were especially friendly along the Wild Atlantic Way on the Connemara Coast. Just walk into any pub and within a few seconds someone will be talking to and joking around with you. I’ll never forget when a local artist invited a fellow backpacker and I to his studio for some mate tea when we were wandering around outside, gaping at the street art with our mouths open. I’ve never seen more street art, or people out sketching and enjoying art, as I have in Valparaiso. The public life is vibrant and there are interesting people to meet around every corner. Because waterfalls are best when shared. Iguazu Falls is one of Argentina’s most-visited attractions and for good reason, I mean just look at that beauty. There are plenty of social places to stay, from mid-range hotels to hostels. A friend of mine told me he enjoyed his guest house so much that it took him three days to actually leave the hostel and go see the waterfall! Live the river life on the Mekong. Much of Laos is great for a solo traveler, but I liked Don Det, aka 4000 Islands, in particular because it tended to have a more community-oriented vibe than some of the other places. I felt like most of the other travelers here came to know each other pretty quickly, and the local fishermen sometimes invited us to fish with them. Because university towns are always a good call. Plus, the food in Bologna, and Emilia Romagna in general, is so incredibly fresh and delicious! Though I already had a place to stay, I met people in Bologna via Craig’s List just to hang out, and ended up with a mixed crowd of locals and students from all over the world. There’s a nice history there, and I got fewer cat calls and purse-snatching attempts there since University towns tend to be a bit safer, people send their kids there after all. Because dive towns attract people. There are a lot of social places in the Philippines, but the best for above and under the water, is Coron and Apo reef nearby. I arrived there solo, joined a snorkeling trip the next day, and had dinner with four new friends that night. It’s that easy in places where people love to SCUBA dive. The white-sand beaches and baby blue waters of Zanzibar are legendary, and there’s so much to do there from diving to swimming, boating, and perusing the markets in Stone Town, it’s attractive for a lot of reasons. I remember laughing and dancing at the reggae bar there with Masai warriors dressed in regalia, local beach boys, and tourists from all over, loving how communal and inviting it was. Even if you go there solo, you can find your people. Just lock up your stuff in the safes, as there’s some petty crime. Much of Patagonia, particularly along the Carretera Austral, is remote and quiet, but if you’re solo, El Chalten is the best mix of nature and social opportunities. The hostels are warm and friendly places, many of the hikes and campsites are well-loved, and it’s easy to meet others on the more trodden hikes. Far from the cat calls of Buenos Aires, I found El Chalten to be a breath of fresh air. After traveling for over four years, mostly by myself, I’ve found some really special gems around this world that seemed have that special something that was missing from many others, and all of these places have that. I was delighted to find, sometimes in the places that I least expected, that such friendly people and that amazing of a social atmosphere could exist, and that’s the beauty of traveling on your own. Need help with the planning, financing, figuring out how to travel for cheap or even free, and what to bring? I love how your places are “off the beaten path.” I’d also add Austria and New Zealand to the list. I loved traveling these places solo. Also great places that I need to see more of! I would love to go all these places! Thank you for picking places that aren’t just the typical “safe countries” lol because honestly most places are safe enough as long as you’re smart and there’s so much more to the world when you open up to places you wouldn’t normally consider. I’ve been considering taking a hiking themed trip which many of the locations you listed would be perfect for, maybe I just need to bite the bullet and do it. Yes that’s what I was thinking! While we havent visited (yet) majority of places on this list we can definetely confirm that Phong Nha ke Bang felt as a very warm and welcoming atmosphere, people came across as genuinly kind if you have any troubles. The owners of the housestay we lodged at also kindly invited us to share their familly dinner and have a nice discussion about the area. That’s so sweet they invited you to join them for dinner! I loved the welcoming atmosphere there and the people I met. It’s been a while, but I had zero problems in Kenya and several other countries in Africa. And of course anyplace in Europe is fine for solo females (though I was refused a table in restaurants in Copenhagen (twice!!) and Thessaloniki. But I never, ever felt unsafe in Europe. And I have traveled around the world, a few times. I agree Europe is good, although there are pickpockets and cat callers in some parts but that’s part of being a female sometimes, sadly. Love your blog, was wondering…for your Iceland trip, how many days do you recommend? I’ve heard a long weekend is great especially if you’re flying from the east coast since it’s a relatively short flight. Also best season/months to visit? Love this list so much! I haven’t heard of so many of these places, so I’m extra intrigued! Patagonia is high on my list! Although I’m so not a camper, hence the reason I’ve avoided it thus far haha. Are there other ways to do Patagonia, maybe more glamping style? It’s so hard to find good info on it. Or maybe it’s that there is so much info that its overwhelming. If you went to El Chalten you could stay in town and do day hikes without having to camp. Much of the rest of it isn’t glamping style, though. You can sometimes stay in the refugios, but they’re usually quite basic as well. Seems like a good place to try camping out. You might really like it! This is an awesome list. I’ve been to quite a few of these by myself as well. I loved Pai and Don Det. Lucky for me, I met people to trek the Torres del Paine with, but it was still a surprisingly sociable experience. I never thought we’d be drinking boxed wine with other campers in the evenings! The boxed wine! Haha same here. Adding these to my list!! Amazing places. All on my to-visit list. Looking forward to my next vacay. Don’t know where to go yet though. OMG so many places to visit! Will have a hard time deciding upon the next destination! Such incredible destinations! It’s great to see some inspiration for solo travellers, especially to locations that are far from the traditional ‘London’ or ‘NZ’. Great post! Some places in Peru are awesome for solo travel as well! Notably Lima and Cusco! Though not all of Peru is safe for solo female travelers (I do not recommend going into the Amazon! but that is in any country with Amazon jungle). Sounds like a great list! I haven’t been to all that places, but looks very amazing and wonderful. After reading this blog, I definitely visit to all these places. Thanks @Kristin for sharing these interesting places. This list is just what I needed to read right now. I’m a copywriter and have been trying to plan my next solo trip – did any of these spots stand out as good for working from? I always seem to pick spots with questionable Internet and want to make sure I get it right this next time! This is a great list! Im looking into starting properly travelling and am trying to plan a few good adventures! this really helped me out! Hi Kristin! I love it that you’ve got Ireland, Coron in the Philippines and Phong Nga in Vietnam on your bucket list. 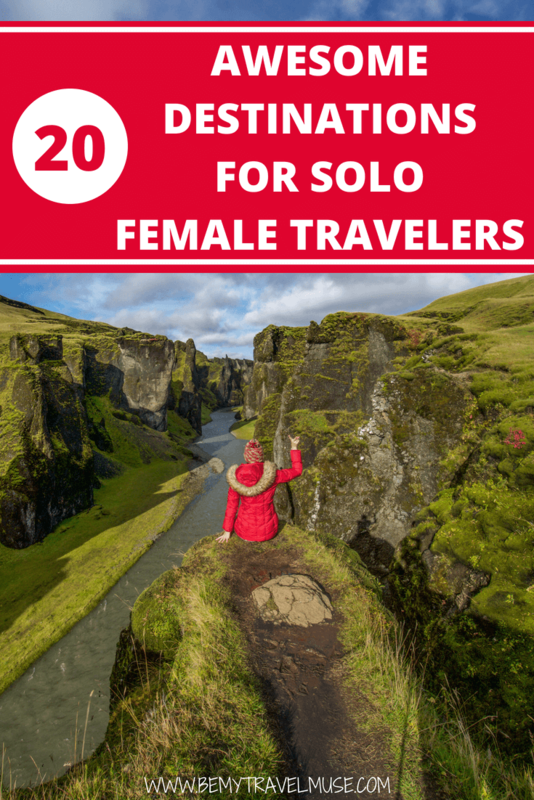 I’ve been to them and can vouch that they rock for solo female travellers 🙂 You’re always pushing boundaries and comfort zones and you’ve got some great hiking spots on here. Thank you for the continuous inspiration. Love what you’re doing. Keep it up! Aw thank you Alice! Glad you like the post and that you’ve been there and love those places too! Hi any info on Canary Islands? Loved your book and blog! I loved how chilled Coffee Bay was too! Just discovered your blog this weekend and have been reading all the articles since then! Just wondering if you’ve ever been to/heard much about Guatamala? I’m considering my first solo trip there this summer before I get married next year and was curious if it would make for a good first time solo trip destination. I’ve only visited Tikal, the big Mayan ruins there. I have heard it’s awesome, though. Nice, conscious communities as well are around. I’d go there in a heartbeat! Oh perfect! Thank you very much! Now to take the plunge….